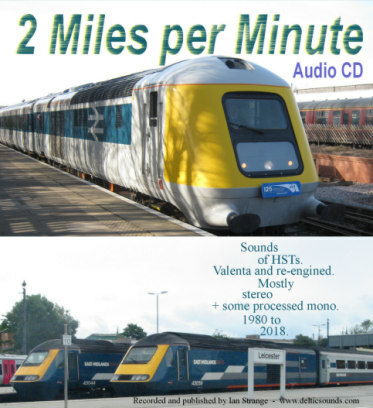 HST sound recordings from 1980 to 2018, both Valenta and re-engined. Some early tracks are digitally processed mono archive recordings (added pseudo-stereo effect). The remainder are in stereo. Lineside and station recordings of the record-breaking Intercity 125s, many from in and around Leicester and Peterborough, plus Stoke Bank. Other locations include Coventry and the Lickey Incline. 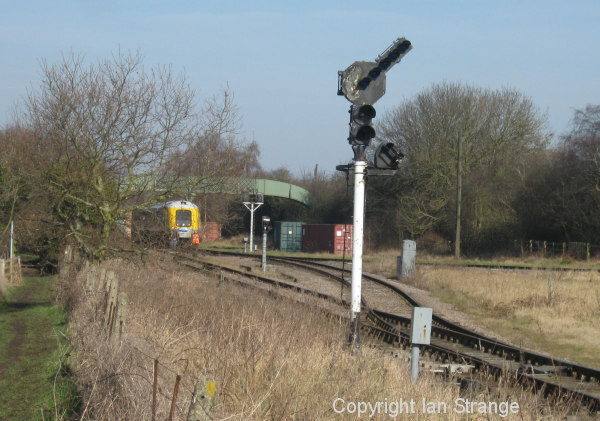 Also, more recent sounds of the prototype 41001 on-train, recorded at the GCR (N). Some nostalgic interlopers into these recordings include classes 08, 20, 31 and even a stationary APT-P.
Rear power-car pulls away from Grantham, 1997. 1	Peterborough. 254024 passes northbound at 1055hrs. 3rd April 1980. (Processed mono recording). 2	Peterborough. As Deltic 55014 stands at the other side of the station on a Kings Cross working, 43157 blasts its horns and tears through northbound with 43072 at the rear. 2nd May 1981. (Processed mono recording). 3	Leicester. 43108 leads a northbound departure from platform 2 at 1056hrs. 18th September 1983. (Processed mono recording). 4a	Leicester at 0903hrs in damp weather. 31415 stands at the head of a Norwich service, as 08465 starts up in the parcels siding. 4b	A Swindon DMU moves northwards along a siding. 4c	Two HST services are announced and 43058/154 arrive at platform 3 (London service), and an almost inaudible arrival of 43103/066 at platform 2. The 08 is coupled up to some parcels vans. 43103/066 depart for Sheffield, then 43058/154 depart for St. Pancras in the background as 31415 sounds its horns and sets off for Norwich at 0911hrs. 17th August 1983. (Processed mono recording). 5	Leicester. 43066/104 stand at platform 3, as a fitter attends to a broken coach window. Meanwhile, 43040/153 depart platform 2 for Leeds at about 2030hrs. 9th June 1983. (Processed mono recording). 6a	Leicester. 31325 runs light as an HST arrives at platform 1. 6b	The HST makes a spirited departure for Leeds at 2116hrs, easing briefly as it crosses onto the down main. 9th June 1983. (Processed mono recording). 7	Leicester. With the mark 1 stock of the Skegness service occupying platform 3, announcements are made for the Intercity 125 Executive service which then arrives at platform 4 at 0808hrs. Announcements are also made for an HST service replaced by locomotive and coaching stock. 20075/072 then back onto the Skegness service. 2nd June 1983. (Processed mono recording). 8	Kilby Bridge. As the sun sets on a fine evening, an HST passes north, easing slightly for the curve at Wigston Junction. 31st March 1989. 9	Kilby Bridge. A St. Pancras bound HST picks up speed after its stop at Leicester on an early evening service. 3rd May 1991. 10	Grantham. Sporting GNER livery, the rear power-car is heard pulling away on a Kings Cross working at 1819hrs, as the light fades. 2nd March 1997. 11	Holme Fen. A Kings Cross bound HST passes at about 1930hrs. 19th August 1998. 12	Holme Fen. Shortly after nightfall, an HST passes southbound and powers into the distance, to a faint background of fireworks. 8th November 2002. 13	Pilmoor. 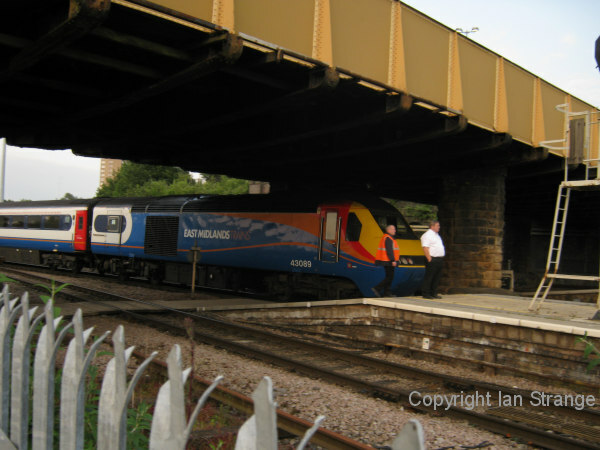 As the sun sets, an HST is heard approaching from the north before shooting passed under a bridge at 1836hrs. 29th March 1997. 14	Waltham St. Lawrence. An eastbound HST flashes passed under a bridleway bridge. 5th May 1997. 15	Coventry. Running 35 minutes late, 43063/122 depart for Edinburgh at 1548hrs. 4th July 1998. 16	Coventry. At about 0730hrs, a Virgin HST departs platform 2 and takes the single track towards Leamington Spa. 12th September 1998. 17	Kilby Bridge. 43059/049 pass southwards at 1106hrs. 10th July 1999. 18	Kilby Bridge. 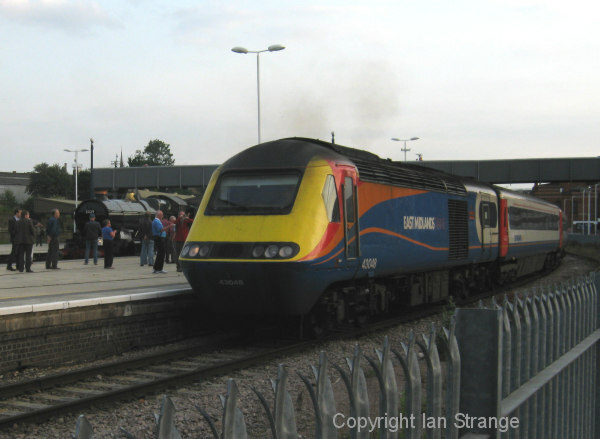 On a spring evening in 2000, an HST passes northbound at 2000hrs. 19	Kilby Bridge. 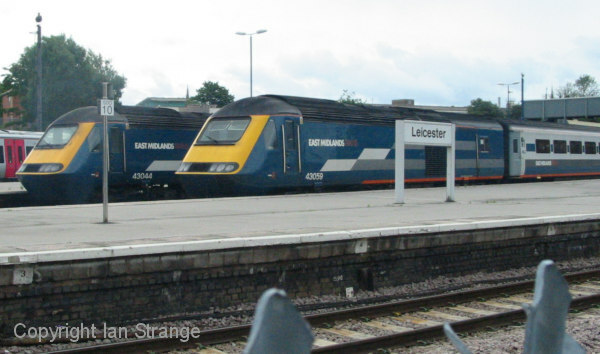 34 minutes after the above recording, another HST passes towards Leicester. 20	Leicester. 43048/047 arrive at platform 2. 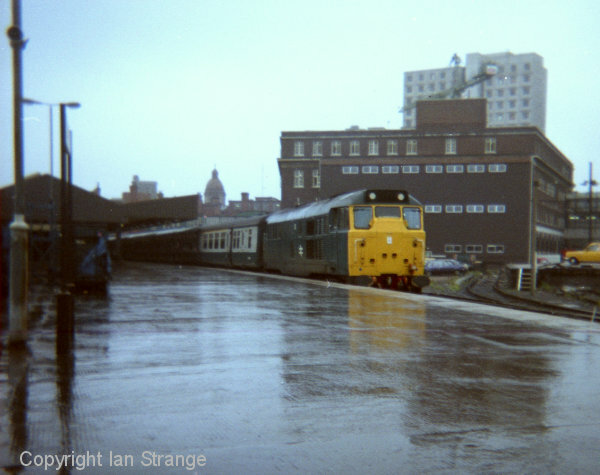 A sprinter arrives from the north before the HST departs northbound on a weekday commuter working, delayed by a preceding class 47. 13th March 2002. 21	Sandy. With some snow on the ground, an HST emerges from the morning mist and races through on its way to Kings Cross. 5th January 2002. 22	Leicester. 43043 leads a northbound departure at around 0900hrs. 1st March 2008. 23	Leicester. As 43044 idles at the rear of a London service, 43059/066 depart for Nottingham at 1208hrs. 19th July 2009. 24	Burton Coggles. A class 170 passes on the down-slow as an HST catches up on the down-fast, at 1834hrs. 12th June 2010. 25	Burton Coggles. Another northbound HST passes at 1945hrs. 12th June 2010. 26	Kilby Bridge. A southbound HST sounds a warning to the farm crossing and passes at 1207hrs. 11th September 2010. 27	Lickey Incline. A Cross Country HST set climbs the gradient at 2135hrs on a bright evening. 9th July 2011. 28	Leicester. 43043/089 depart for Nottingham at 1934hrs. 25th June 2013. 29	Leicester. 43048/049 depart for Sheffield from platform 1, at 1945hrs, as Castle Class 5029 stands at platform 2. 25th June 2013. 30	Cossington (north of Syston Junction) on a very wet morning. The driver of a northbound HST blares the horns as a steam photographer strolls over the foot-crossing, at 0836hrs. 7th May 2011. 31	Loughborough, just south of the station. 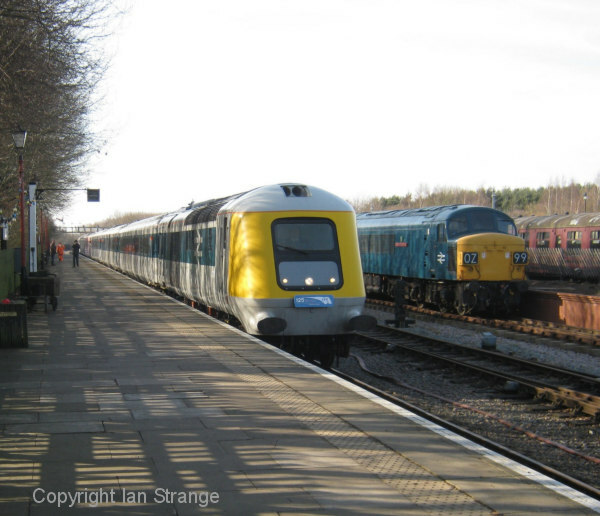 An HST passes by on an up service, at 1351hrs. 1st March 2014. 32	Conington. 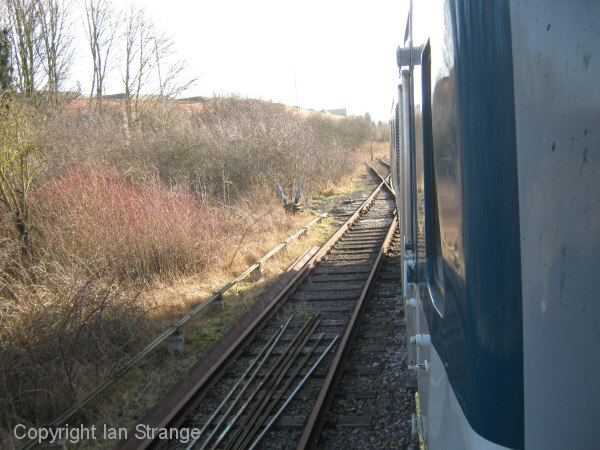 An HST sweeps passed northbound at 0916hrs, heard a slight distance back from the line, and the crossing barriers lift. 12th June 2010. 33a	Creeton (north of Little Bytham). At about 0850hrs, an HST passes down hill on the up-fast. 33b	2 minutes later, another HST follows down hill. 25th July 2012. 34	Burton Coggles. An East Coast HST climbs Stoke Bank, sounding horns to photographers awaiting a steam special. 12th April 2014. 35	Shipton (4 miles north of York). The early morning breeze carries the sound of an East Coast HST picking up speed after departing York. A car passes, and then a southbound Voyager, before the HST powers by at 0741hrs. 12th April 2014. 36	Marholm footbridge. In the fading light, a northbound HST picks up speed and passes underneath the mic, at 1823hrs. 8th March 2014. 37	Lickey Incline. 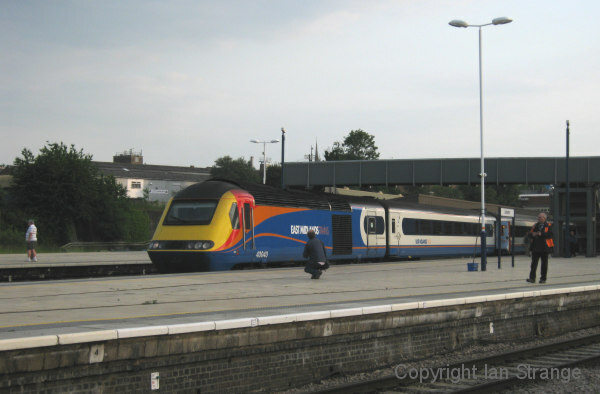 An HST tackles the 1 in 37 passing at 2137hrs on a bright evening. 9th June 2012. 38	Werrington. An East Coast HST passes northbound at 1927hrs and powers away up-wind. 31st August 2013. 39	Little Bytham on a dark and windy evening. An HST climbs Stoke Bank at 1936hrs. 15th March 2014. 40	Little Bytham. Another HST passes north at 2104hrs. 15th March 2014. 41	A bonus track, featuring a stationary APT. No exciting action, but extremely rare to hear any APT sounds recorded. At Rugby, APT-P 370 004 creates a very deep humming as it stands alongside the station, to a background of announcements and a class 25 running light. 22nd October 1980. (Processed mono recording). 42	On a bitterly cold, sunny, afternoon, 41001 departs Ruddington South Junction (Great Central Railway North) at 1219hrs. The driver sounds warnings to some p.w. workers attending to track maintenance. 47828 brings up at the rear of the train heading onto the branch to Ruddington. 24th February 2018. 43	41001 glides gracefully into Ruddington Fields at 1425hrs. 24th February 2018. 44	(On-train) With the characteristic creaking from the gangway connection, 41001 passes over a cross-over and accelerates, its sound reflecting back from industrial buildings. We arrive at Rushcliffe Halt at 1518hrs. 24th February 2018. 45	(On-train) 41001 clears a 10mph restriction and gives us a loud blast through Barnstone Tunnel, on our way south. 24th February 2018. 46	Marholm. The driver sounds warnings to p.w. staff at trackside before 43307/272 shoot passed at 1003hrs on the down-fast. 7th July 2015. 47	Coventry. Running 7 minutes late, Virgin liveried 43087/099 make a storming departure from platform 2 at 1524hrs, on their way to Edinburgh. 19th June 1999. Tracks 23 to 40 and 42-47 made on top quality solid-state recording equipment.